No matter how long you've been involved with Texas child nutrition or what position you hold, it's likely there is still something you need to learn. Trends, liability, changes in laws, new legislation, and innovations in foodservice happen constantly. 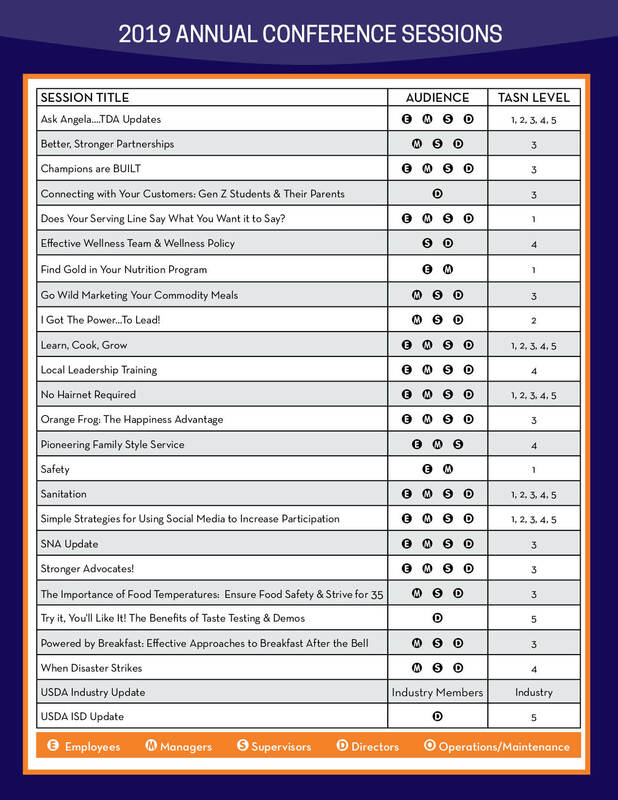 TASN is busy selecting and arranging the best and up-to-date educational sessions and classes ranging from certification and in-depth training to the most current issues and topics affecting you in Texas K-12 foodservice. This three-day workshop will prepare new trainers with critical training skills and introduce seasoned practitioners to the latest techniques for delivering powerful training. Whether you have been a trainer for years, or have never been in front of a classroom, this workshop will show you how to become a facilitator of learning. This training contains lessons and activities which allow participants to be actively involved in learning the food safety concepts needed to prepare and serve food safely and to keep school nutrition facilities safe and sanitary. The chapters cover topics such as: food safety, prevention of foodborne illness, basics of microorganisms, how to keep a clean and sanitary school nutrition facility, process for foodborne illness prevention, and food safety programs in schools. Food Safety Basics is a four-hour training for school nutrition managers and employees to provide a basic understanding of food safety. This training enables them to begin the job using safe food handling practices including good personal hygiene practices, important food temperatures, methods of preventing food contamination, and steps for developing a food safety program. Click on the image below to view and download the PDF version. Please check back often as we will be adding learning sessions to this page.